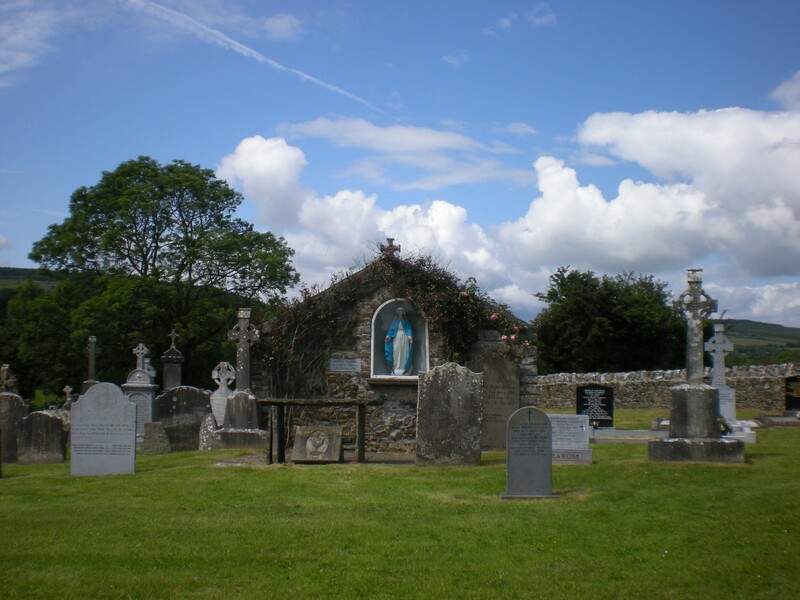 The graveyard is in rural area surrounded by pasture land, adjacent to the county border with Kilkenny. Graveyard contains ruins of medieval church dedicated to St Bridget, marked on 1841 map as 'Aharney Church (in ruins)'. In early 20th century the ruins measured approximately 13m by 5m, however church ruin now only consists of west gable wall. Graveyard contains headstones dating from 18th to 20th century , mostly upright and in good condition. West gable wall of ruined church now used as a grotto. The altar and the paving around the grotto is constructed from reused grave markers. Situated about 200m to southeast of graveyard is the site of a holy well dedicated to St Bridget. Graveyard has D-shape; boundary stone wall c.1m. Easy access from local road with gate and stile in boundary wall. Gravel path inside gate of graveyard. Ground surface is level mainly with occasional bumps. The paths, grass and hedgerows are maintained.